"They" say, we should all walk a day in another's footsteps, so I thought I would share a "typical" day for Zack at the Hospital. The day starts out early around 5:30 am. This is when the nurse comes in and checks their final vitals before shift change at 7 am. They start with Zack's blood pressure, temperature, pulse and heart rate. The blood pressure cuff can get so tight that he feels as if it is cutting off any circulation to his finger tips. When checking for his heart rate he must breath in and out deeply, something they are still trying to teach him to do, you can barely tell he is breathing during this. The first two nights Zack had a low grade fever, so they check it more often. The Doctor advised us that some of the medicine he is on can also mask a fever, so they are monitoring this very closely. We have already been advised there is a possibility that his fever will come back at home once off the medicine and should this happen we will be back at the hospital. His port is accessed and they take a couple of vials of blood, this will be sent downstairs to the lab to check for two separate results: One is the bodies Chemistry results for Sodium, Potassium Chloride, CO2, Anion Gap, Glucose, BUN, Creatinine, calcium, phosphorous, protein, Albumin, Bilirubin, Alkaline Phosphatase, ALT, AST, Osmolality, Megnasium. The other is Hematology Results: which shows his WBC count, RBC, Hemoglobin, Hematocrit, Platelet Count, Nucleated RBC, Neutrophls Absolute, Segmented Neutrophils, Lymphocytes, Monocytes, Eosinophils, Basolphils, Metamyelocytes, Myelocytes, Promyelocytes... (whew.. that's easy for you to say!) Once this is all completed he is able to go back to sleep, until the next shift change. It is now 7 :30 am. The day nurse comes in and checks his urine sample which is also sent to lab, she then changes out the IV fluids. 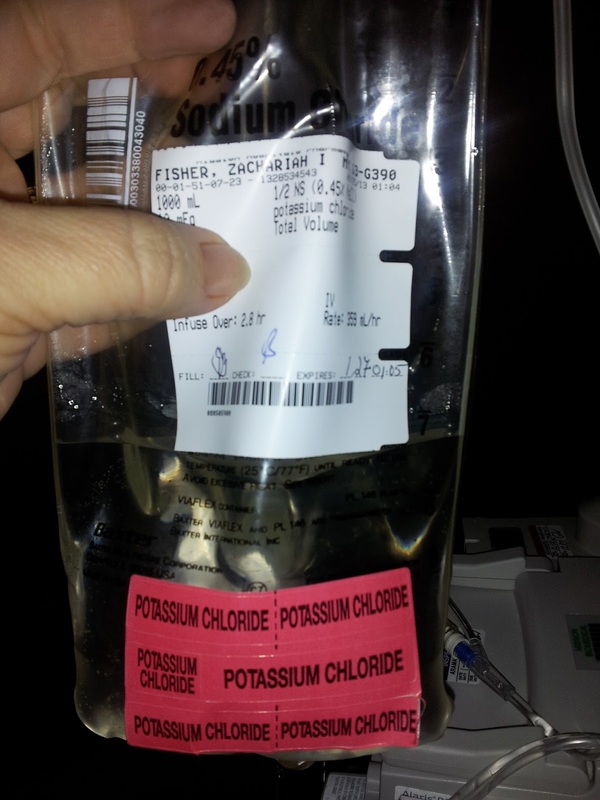 Based on the lab results, the nurse changes the sodium chloride to potassium chloride, because his potassium levels are low. She then leaves as fast as she came. After the initial check, He usually doesn't see anyone until close to 9 am. Most of the time, he simply falls back asleep . Since he asked that all hospital meals be cancelled, we have pre-purchased meals that are kept in a small refrigerator down the hall. He has cream cheese danish, muffins, bananas and grapes to choose from for breakfast. Karen (social worker) told me I should eat the meals, "they are free!" I looked at her and said "oh no they are not! ", we both then laughed as she realized what she said. Around 9 am the doctor comes in to share the lab results. They mostly cover the Hemoglobin, and Platelet count with us. These are the two primary concerns as they directly effect the immune system. If the counts are low during hospital stay (as well as at the clinic) they will order blood and / platelets. The doctor does his exam which consists of checking his pulse, heart rate and checks his stomach for bruising, which is where he gives himself his daily shot of lovenox (anti blood clot medication). Heavy bruising could mean low platelet count. The rest of the day is spent with his nurse coming in changing out the fluids, taking more vitals and recording everything into the computer. Zack tries to entertain himself with his games on his X-box which can be connected to the television, which is also equipped with DVD player. The games seem to last one day and then boredom sets in. He really never feels fully well enough to stay with one thing for long. He will watch a movie, then take a nap, wake up and play a video game and text. His moods stay about the same, he is fed up with everything and have every right to feel that way. It is now 3 pm. 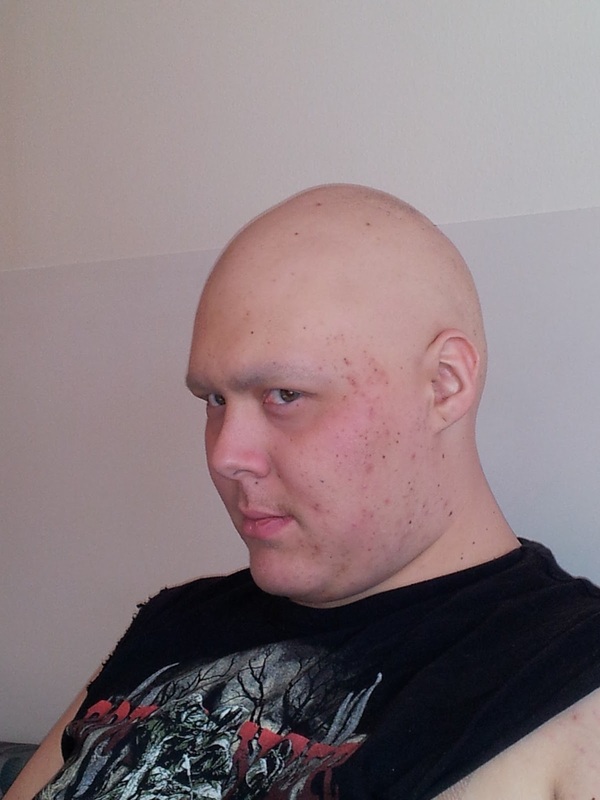 Each day, from the first day, they have "shortened" the time to begin his chemotherapy, so that he can get out Saturday night instead of Sunday. The nurse enters with several bags of fluids. Each is marked with his full name, date of birth and the chemical that are contained. The nurse must dress in full protective gear consisting of goggles, mask, gloves and disposable gown. She scans all of the bags which is then entered directly into the computer. The nurses call button is pushed and she asks for another nurse to come in and do the "time out". As previously explained in an earlier blog, this is when the one nurse reads everything off of the label and the other nurse makes sure the information matches his ID bracelet. 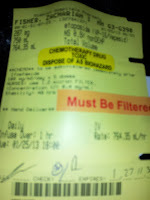 They then must compare the bags to the treatment that is listed on a document. 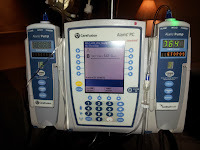 Once the time out is completed, everything is connected to the IV tower and the "beeper" as I like to call it is programmed for the treatment. At times there could be an air bubble, this will cause the machine to beep, warning us of the problem. When this occurs we call for the nurse who then comes in, checks the line and once she removes the air bubble, re sets the program. Air bubbles are very serious, having an air bubble in the line could cause the air to go into his vein causing a clot. The bags are switched out several times, larger bags are changed for smaller one which are then connected to the saline solution. All of these are run through his port access, into the port and through his entire blood system. It usually takes three to four hours for completion of each treatment. Zack is able to get up, use the bathroom, get drinks or snacks (if he feels up to it), but must take the tower with him. Constantly having this metal contraption following you around a small room, wires connected to the outlet, tubes connected to his chest, this can all get on his nerves rather quickly. 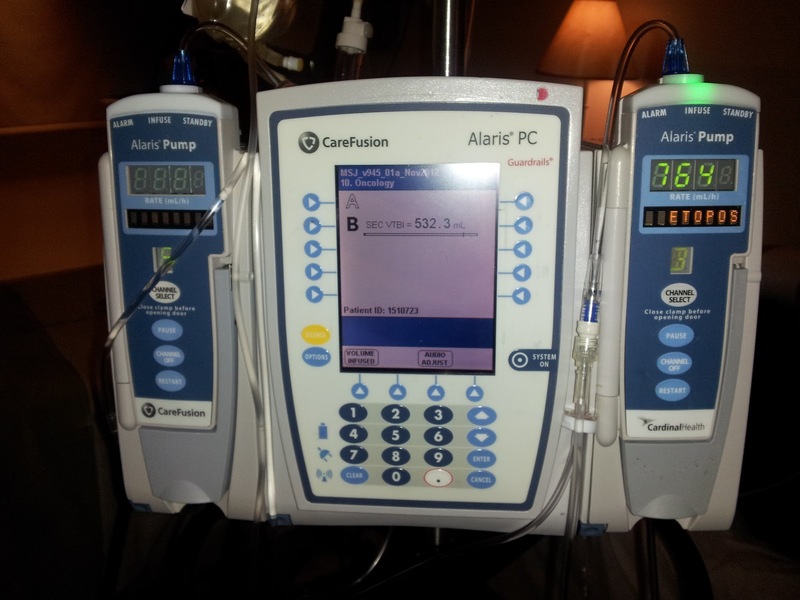 "Infusion complete", is one of the phrases we like to see on the machine. This means another finished day of chemo. Once treatment is done, they must check his blood pressure for one hour, which means the cuff stays on the entire time. Zack has become a pro at this, he takes off the cuff ones the pressure is taken and once the machine starts again, slips it back on. Once in awhile he is not fast enough, so we stop the machine, he puts on the cuff and we restart. When you spend this much time in the hospital, you get to know the equipment. Nausea has now set in with a vengeance. We ask the nurse for Benedryl, which usually knocks him out. It takes her awhile to bring it and once it is injected into his port he immediately is asleep. That is when I grab my moment to head downstairs to grab and early dinner. I decide to also pick him up something while down there, since it is not safe today to go outside (we had an ice storm). When I return there is another shift change. It is now 7 pm and the nurse from last night is back on tonight. She is very sweet, but I must ask her to do better than last night. I try and understand that they have a full plate with every room full, but sleeping on two mattresses on the floor and having to get up each time the machine beeps to turn it off and then reach over Zack for the call button, gets old quickly. Zack then, wakes each time I do, gets up and goes into the bathroom. He is being given so many bags of fluids, he is never able to sleep through the night. Last night was no exception. Zack's bandage around the port access is loose, so we ask the nurse to change it. In the past he had a problem with the needle which is inserted (port access) into the port coming out and we wanted to make sure this didn't happen again. They tape over the port access with a clear bandage, which keeps it in place and keeps it clean. When the nurse changes the dressing, she puts on a full face mask, gloves and asks Zack to look away so as not to breath on the access. She explains that even the slightest amount of dirt could cause an infection. The nurse apologizes for last night and promises to take better care tonight. We are very appreciative that she will do her best, that's all we can ask. The baby that was in the room next to us has been moved to another room in order to make room for another oncology patient, her mother, father and baby sibling. The back of the hall is restricted to oncology patients, but with no room left in the hospital they are placing children wherever they can. We were advised by the nurse that there are children in Emergency Rooms waiting for rooms upstairs. Since Zack sleeps on the couch, a nurse comes in and asks if she can give his bed mattress to the family in the next room. She advised us that several of the staff are having to stay in the Hospital, due to the bad weather, and there are no more mattress' for the family members. I gladly help her carry it to the family and offer a couple of bananas while I'm there. Anything to help them feel more comfortable. I try and tease Zack about trying out the perfect, firm bed, but he is not amused. He is jumpy and wants to get the hell out of here. I think part of it is the Benedryl as he usually doesn't act this way, but at this point it doesn't really matter. We will try and get a good nights sleep, knowing that his fluids will be changed out every hour or so, knowing that he will have to get up to use the bathroom all night, hoping the beeping will be at a minimum and won't keep him up. His vitals will again be checked early in the morning and the (new) baby next door might keep him up crying. Then, we start the day all over again. The difference about tomorrow is, we will be going home later in the evening and KNOWING he will have a good night's sleep in his own bed and wake up to a better week. First day in Hospital, THE LOOK!!! "My how you've changed, since I've changed"
Hit with a 2 x 4!